Beginning with his rookie year in 1960, Oscar Robertson averaged a triple-double through 1965. He was the league MVP in ’64 and the All-Star Game MVP in ’61, ’64, and '69, never failing to make First Team All-NBA through the ’69 season. 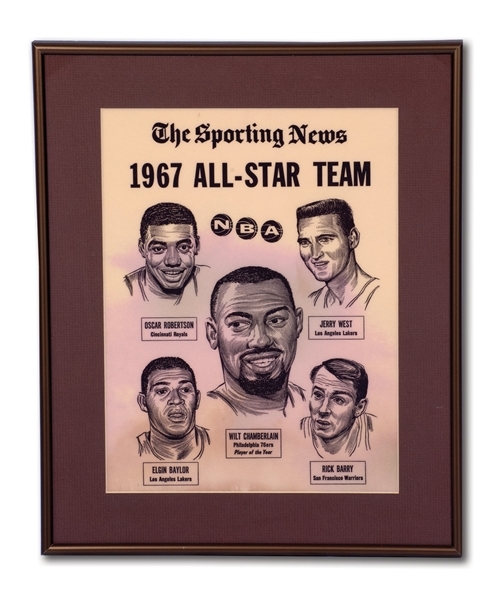 This is Robertson’s framed award plaque recognizing his selection to the 1967 NBA All-Star First Team as presented by The Sporting News. Fine artistic caricature portrayals of Oscar, Elgin Baylor, Bob Pettit, Bill Russell and Jerry West are featured on a 9.5" by 12.5” sheet that has been matted and framed under Plexiglas to overall dimensions of 13.75" by 16.75". It comes just as Oscar displayed it in his home for several decades. Includes LOA from Oscar Robertson.